Our betters tell us there is no correlation between illegal immigration and crime, yet in this case, a Mexican fugitive, wanted for kidnapping was arrested in the U.S. Not only did this illegal immigrant kidnap someone, but his group shot him several times and the man died of his wounds. It seems our nation is truly a refuge for the criminal class from south of the border and our government allows it to happen! EL PASO, Texas — A 27-year-old Mexican man wanted for allegedly kidnapping a man in Ciudad Juarez, Mexico, six years ago was removed Monday to Mexico by agents with U.S. Immigration and Customs Enforcement’s (ICE) Enforcement and Removal Operations (ERO). 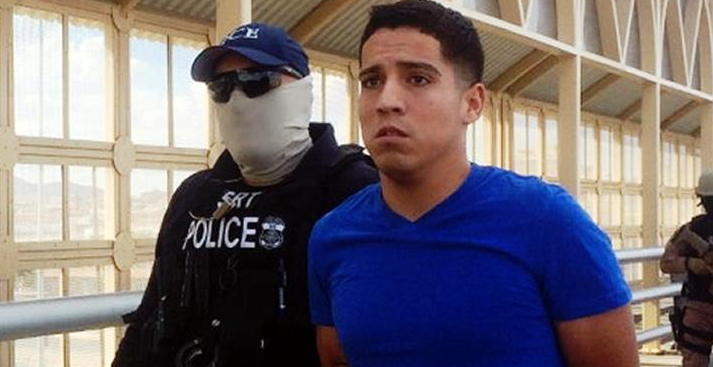 Cesar Vega-Muñoz was turned over Sept. 14 to Mexican officials at the top of the Stanton International Bridge Port of Entry. Vega-Muñoz, a gang member, is one of seven men who are charged with the aggravated kidnapping of Natividad Torres Leyva, who was kidnapped about 6:30 a.m. Sept. 15, 2009. A group of men kidnapped him at gunpoint in front of his house in Ciudad Juarez. The men asked him to get into their vehicle, and when he refused, one of the men pointed a gun at Torres Leyva’s wife. Since U.S. Immigration and Customs Enforcement (ICE) was established in March 2003, the agency has removed hundreds of thousands of aliens, some of whom fall under the category of high profile removals. He eventually got into the vehicle with the men, who held him against his will overnight. During the time the men held Torres Leyva captive, Vega-Muñoz allegedly was the one who negotiated the ransom over the telephone with the family. He initially asked for about $47,000 dollars, but finally settled for $700, a television and a 2008 Toyota. The men shot Torres Leyva four times the afternoon of Sept. 15, 2009, and released him the following morning. He died Oct. 21, 2009, at a Ciudad Juarez hospital from complications of the gunshot wounds.